The OEM Chart command provides access to a popup chart which displays characters 0 to 255 in the OEM (ASCII) character set. 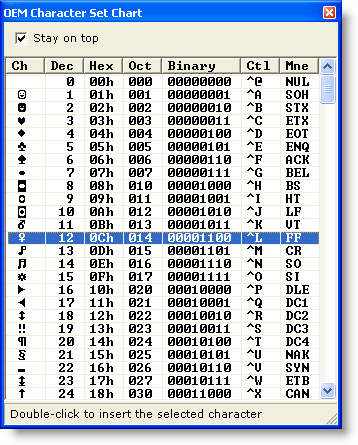 The character's visual representation is shown in the leftmost column, followed by the character value in decimal, hexadecimal, octaland binary formats. In the two rightmost columns, the equivalent control letter sequence and mnemonic expression are shown for values in the range 0 to 31. To jump directly to a character of interest simply press that character on the keyboard. The OEM Chart can be used to insert a character into the file being edited. Simply double click on the entry for the desired character, or highlight the character in the chart and press Enter. When the need to insert a special character or symbol arises frequently, consider using the Insert Symbols feature rather than the OEM Chart command. The Insert Symbols feature permits a defined character to be entered using a single keystroke. Right-clicking on a selected item summons the OEM Chart context menu. The context menu provides an option to copy the selected character to the current clipboard. The OEM Chart can also be used to convert between bases for values in the range 0 to 255. Simply locate the value to be converted in its proper column and read the converted value from the column of the new base. If you prefer that the OEM Chart remain atop other windows, select the Stay on top option. The OEM Chart is a non-modal window, which allows it to remain on-screen after focus has been returned to another editing window. If the OEM Chart is left on-screen when Boxer is closed, it will be automatically reopened if the edit session is later restored.